Winter is coming! Is your backyard habitat ready? Autumn tried to tip-toe away without us noticing this year! This cold and blustery wind, while a little unsettling, is a vivid reminder that winter is officially just weeks away. It’s time to make sure our backyard habitats are ready to provide a safe winter haven for our wild birds. Quality food with high fat seeds, suet and nuts is essential. 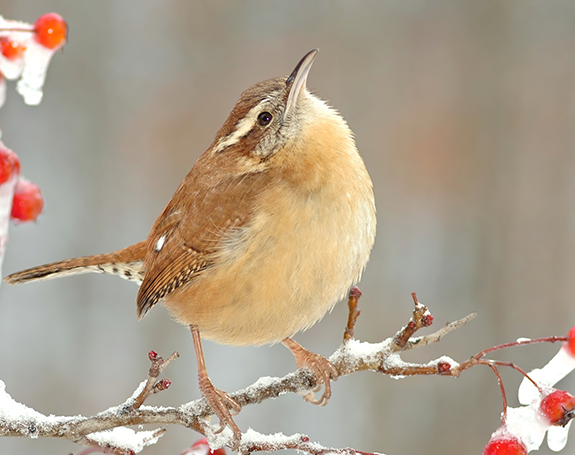 Food quality directly affects a wild bird’s ability to stay warm and survive. Check feeder levels more frequently. No Bread!!! Ever. EVER! Remind everyone you know that bread has ZERO nutrition for wild birds. A small bird will freeze to death overnight with a stomach full of empty-calorie bread crumbs. Empty calories are lost nourishment! Find out why in ‘Why Quality Food Matters‘ in our website’s Resources section. Water is critical all year round. We can’t stress this enough. All birds require water for drinking and bathing — even in winter. A consistent, ice-free water source is also an opportunity to attract wild birds you never see at feeders! If your bird bath is concrete or ceramic, prevent cracking (and protect your investment!). Place a de-icer in your bird bath top or substitute with a winter-proof bath––One that is sturdy plastic, granite, metal or one that has a heater built in. Put your other bath away until spring. There are several heated bird baths and de-icers that The Backyard Naturalist recommends. They are super-easy and economical. Read more here. Your water source doesn’t need to be fancy, just un-frozen! Visit our ‘Wild Birds, Winter and Water‘ page for more info on how to establish and maintain a winter water source. Or, just drop by the store and tell us about your backyard and budget. We’ll help you find the best and most convenient solution for you and your birds.